Blank. Bare – empty – plain. Blank pages. Blank beaches. Blank expressions. Blank rooms. How can you resist not wanting to change – to alter – to make your imprint on them? 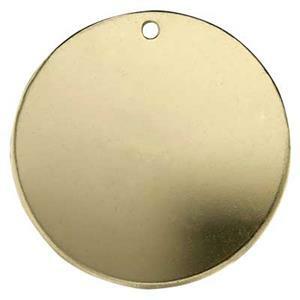 At Halstead, we have 14/20 Yellow Gold-Filled 25.5mm 24 gauge Round Blanks with a 1.1mm Inside Diameter Hole. Just waiting … waiting … for you to make your artistic mark, your signature stamp on them. These were never meant to be left well-enough-alone.